Yes, shipping is free of charge. If the total value of your order exceeds $30, customs duties may apply in a few cases. If you have a larger order, it is worth placing individual orders. I don´t know some brands? We have cooperations with some manufacturers. They produce articles for different brands, among other things they also have their own brand. We have well-known and less well-known brands on offer. Of course all are genuine. What if I don´t get the goods? 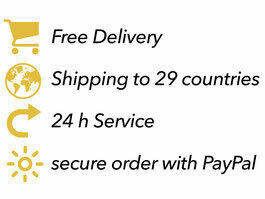 You should receive your order within 18 days. If the delivery has not yet arrived, please contact us at info@bagsister.com. You will get your money back within 7 days. Are the prices really that cheap? The goods themselves are often not as expensive as you might think, but the additional warehouse, branch, transport and employee costs are all around it. Therefore, well-known brands actually sell the same items at higher prices. We always try to offer the best price. I am not satisfied with my product! Happens! For that we have the buyer protection.